We only offer open-pollinated and heirloom varieties that are well suited to the growing conditions of north Idaho. All plants have been test-grown in our own garden. Each plant is started by us from seed — many plants are grown from organic seed stock — and all seed stock is non-GMO. Each seedling is individually transplanted by hand in a recyclable growing container. Plants are hardened off and ready to start growing in your garden. We offer more than 20 varieties of heirloom tomatoes — from the traditional large, meaty beefsteaks to tiny, super-sweet cherry varieties. Our selection does vary year-to-year, as we often add something new (to us) to our lineup — and with more than 7,500 types of tomatoes, there’s always something new to try! Click to shop our selection of Heirloom Tomatoes. In addition to heirloom tomatoes, we offer a variety of open-pollinated and heirloom vegetable plants including peppers (sweet and hot), cucumbers, and squashes. We also grow a variety of herb plants, including several types of basil, flat leaf parsley and cilantro. Click to shop our selection Veggie Starts and Herbs. We know not everyone has space for a large garden, but everyone loves the taste of “home-grown.” Therefore, we offer a variety of space-saving heirlooms that are perfect for container gardening or small gardens. These plants are listed with”patio-perfect” next to their name. What is an heirloom? An heirloom is a plant that has a history of being passed down through generations. The age of which a plant achieves heirloom status is somewhat subjective — some say heirlooms must have been created prior to 1940, while others state the variety must be at least 50 years old. Regardless of age, all heirlooms are open-pollinated, which means it will produce true-to-type seeds; but not all open-pollinated plants are heirlooms (there’s that age thing again). What does open-pollinated mean? This generally refers to seeds that will “breed true.” When the plants of an open-pollinated variety self-pollinate, or are pollinated by another representative of the same variety (by insects, birds, wind or humans), the resulting seeds will produce true-to-type seeds and plants roughly identical to the parent plant. This is why you only save seed from open-pollinated varieties — you’ll get the same plant (and fruit) as the parent plant. Find more helpful gardening terms in our Glossary. Please subscribe to our blog for gardening tips and news from The Coop. Sign up at the bottom of the page! The images below are of tomatoes and veggies grown in our garden in Coeur d’Alene. You can grow these too! This heirloom variety is from Mexico. Beautiful and meaty. Amos Coli is a huge Roma-type heirloom. Perfect for sauce and salsas. Cream Sausage is a customer favorite. Bright yellow, oblong fruits are perfect for sauce, salsa or eating fresh. 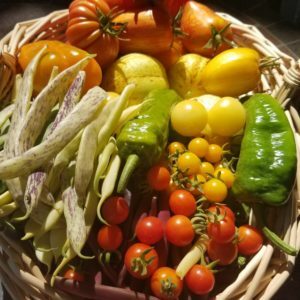 A basket of summer joy -- heirloom tomatoes, peppers and tomatillos. The Pink Bumblebee Cherry tomato is a pretty as it is tasty -- and very prolific. Speckles lettuce fresh from the garden. The White Cherry is a cousin to the black or chocolate cherry -- same sweetness in a pale yellow color. Extremely prolific. A variety of heirloom tomatoes grown in our garden. The very popular Green Zebra -- sweet-tart and stunning. Healthy, locally grown heirloom tomato starts ready for your garden!! Our green house and tomato starts. The Striped Roman is a customer favorite. Large, oblong fruits are meaty and juicy. Heirloom beans. From left, Roma, Dragon Tongue, Royal Purple, Tongues of Fire, Yellow Roma. All grown in our garden. Find us at the Wednesday Farmers' Market for heirloom tomatoes and veggie starts. 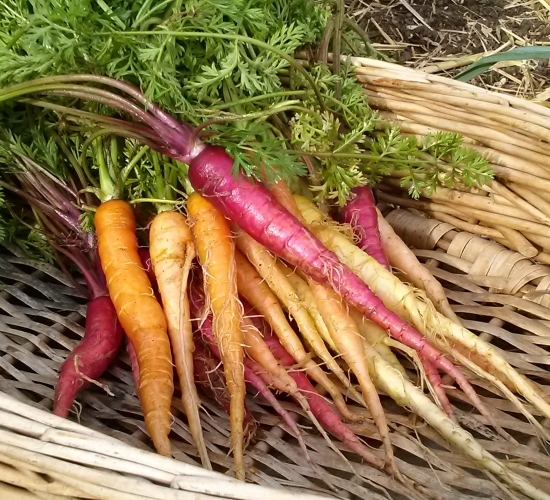 Spring carrots in a rainbow of colors.